William Murosky is the fourth recorded child born to Anthony Murosky, Sr. and Eva Zielinski in Forest City, Susquehanna County, Pennsylvania. He was born July 11, 1902. William also went by Bill. In 1910, William was living with his parents at 128 Delaware Street. At age 7, he was recorded to be attending school. In the 1920 United States Federal Census he is recorded as Willie. He was living with his parents at 408 Main Street in Forest City, Pennsylvania. He was able to read, write and speak English. When the census was taken in January of 1920 he was not working. Following the path of his siblings, William also relocated to Erie, Erie County Pennsylvania. William was recorded renting a home at 523 E 21st Street in Erie, Erie County Pennsylvania in 1940 per the 1940 Erie City Directory. On August 12, 1942 at age 40 he enlisted in the Army under the name William Muroski. He was living in Erie, Pennsylvania when he enlisted. The enlistment records indicate he was single, with dependents. No additional details are currently known about the dependents referenced. It is unknown if William ever married. William served as a Private in the Army Air Corps, a branch within the Army Air Force, between August 12, 1942 and January 27, 1943. He is also recorded as living in Erie when his brother Anthony Harry Murosky, Jr. died in January of 1950. William died on October 22, 1971 in Erie, Erie County Pennsylvania at age 69. He was buried at Calvary Cemetery, Lot No 35, Grave 1095. His tombstone reads William Muroski. 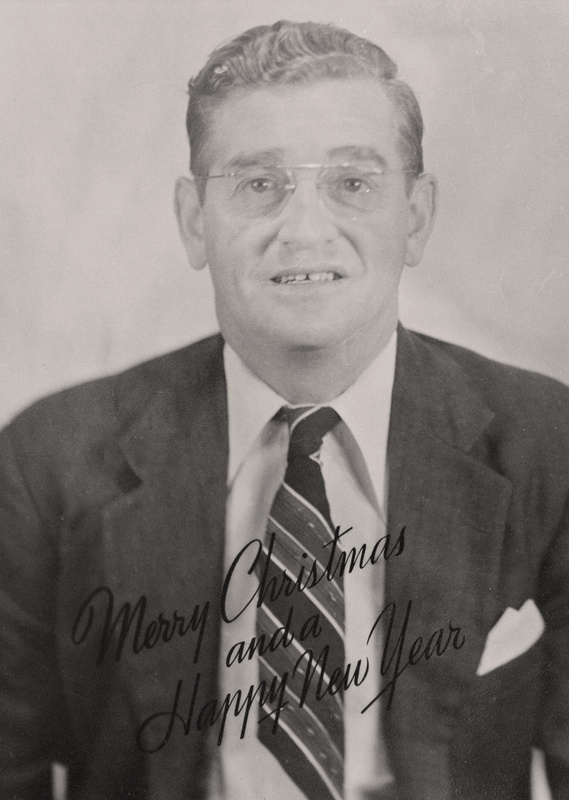 This holiday greeting card is one of the only known photographs of William Murosky. The date of the photograph is unknown. The photograph was located in an old black page album that was included in the Helen Tillie Bukowski Collection. Helen was married to Anthony Harry Murosky, Jr. who was the brother of William Murosky. Photographer Unknown. Editing and digital restoration by Michelle M. Murosky. William Murosky is my 2nd great uncle. William Murosky is the brother of Anthony Harry Murosky, Jr. my great grandfather. 1910 United States Federal Census. Year: 1910; Census Place: Forest Ward 1, Susquehanna, Pennsylvania; Roll: T624_1421; Page: 13A; Enumeration District: 0064; FHL microfilm: 1375434. Record for Anthony Meroskie. 1920 United States Federal Census. Year: 1920; Census Place: Forest City Ward 1, Susquehanna, Pennsylvania; Roll: T625_1655; Page: 3A; Enumeration District: 68; Image: 226. Record for Anthony Maroski. Ancestry.com. U.S. City Directories, 1822-1989 [database on-line]. Provo, UT, USA: Ancestry.com Operations, Inc., 2011. Erie, Pennsylvania, City Directory, 1940. Page 347 of 617. National Archives and Records Administration. U.S. World War II Army Enlistment Records, 1938-1946 [database on-line]. Provo, UT, USA: Ancestry.com Operations Inc, 2005. Record for William Muroski. Pennsylvania Historical and Museum Commission; Harrisburg, Pennsylvania; Pennsylvania Veterans Burial Cards, 1929-1990; Series Number: Series 1. Record for William Muroski.